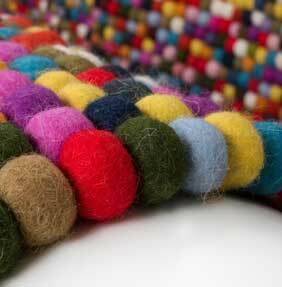 Felted wool has been around for many years, this type of yarn has been very popular and very suited to rug production. Recent demand and new manufacturing techniques has enabled weavers to try out new methods, produce so amazing results! The fundamentals of the felting process have remained virtually unchanged. Wool is spun like normal and then woven into shapes, the shapes are then washed at a very high temperature, this process condenses the fibre and allows the wool to become thicker and softer whilst keeping a firm shape. Once this process has been completed the wool won't unravel so it’s ideal for rug production.